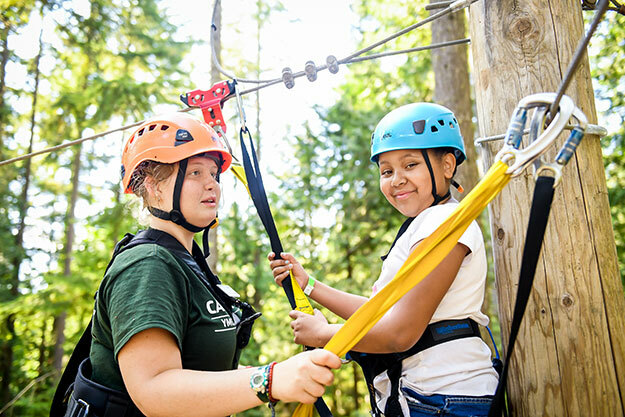 Camp Corral is a 501(c)(3) tax-exempt, nonprofit corporation that provides a free one-week experience where the children of wounded, ill, injured, or fallen servicemembers can attend the YMCA Camp Seymour near Gig Harbor at a low or no-cost to the family. During their week at camp, military kids participate in traditional summer camp activities like arts and crafts, archery, sports, swimming, canoeing and kayaking, teambuilding, learning positive values and building emotional resilience with other military children that relate to their specific military background. "Although any child from a military family is eligible, registration priority is given to children of wounded, injured, ill or fallen military servicemembers," said Camp Corral Marketing and Development Director Diane Jackson. Since its founding in 2011 as a one-camp pilot program, Camp Corral has grown over 750 percent, with over 17,000 children served thus far, and since it's infancy, the Camp Corral program has expanded to 22 camps in 19 different states. YMCA of Pierce and Kitsap Counties and the Armed Services YMCA of the USA have formed a partnership to help offer even more camperships for summer 2019. Although the entire cost of camp might not be completely covered for all military children, Camp Corral still offers a discount for all military members that apply. "Active-duty servicemembers and full-time National Guard and reservists stationed in western Washington are able to apply for a week of summer day camp at YMCA Camp Lake Helena or a week of overnight camp at YMCA Camp Seymour at a subsidized rate," added Jackson. Each year, the funding for the Camp Corral program comes from the Armed Services, YMCA and the YMCA of Pierce and Kitsap Counties' Annual Campaign. In 2018, YMCA Camp Seymour was able to serve 200 children from military families (as a Camp Corral partner camp) and provided them a one-of-a-kind summer experience where they could enjoy just being kids, bond with other kids who've been through similar experiences and learn valuable life lessons. Do not just take it from this article, let some of the military children who have previously attended the camp provide their first-hand experience. Zoe, 11 years old -- "My favorite activity would probably be co-op, because it's a lot of teambuilding activities and rope swings and that type of stuff. I've learned a lot of teambuilding and friendship stuff, and a lot about trust. I personally think that going to Camp Corral is important because it's getting to meet kids who have probably gone through the same things that you have and being able to understand, ‘oh, hey, I know what that is.'" Kamryn, 14 years old -- "The most important part of camp is Morning Inspiration; it's basically where they reiterate the four core values: caring, honesty, respect, and responsibility. Camp Corral is really important because kids come here to have a good time. Sometimes, they don't have either the support at home, or their parents are deployed or something like that, and so they come here and you know you're always welcomed here and you're always going to have a family here." Camp Corral is now accepting applications for the Summer 2019 season, and if you have a referral of kids that are children of fallen, injured and/or disabled military servicemembers, please visit: campcorral.org/camp-experience/ or you can acquire more information on this opportunity for any military family by visiting: campseymour.org/programs/military-campership-program/.